Every S.P.A.C.E. contributor submits a bio to accompany their work. But what details of their lives, of themselves, should a contributor focus on? The possibilities are almost endless, not completely known, and unfinished. Florencia is an 18-year- old Mexican girl living in Montreal, Canada. She’s in her 2nd year in the Arts and Culture profile of the A.L.C. program at Dawson College. A believer. In the power of vulnerability and self-love to heal the world. A middle child. Part of a unique and diverse family. An immigrant. Moving from a sun-kissed country to a freezing one. A student. Not only a college student, but a life-long learner. A friend. Although she’s pretty weird, and sometimes hard to handle, she’s loyal and caring. A writer. She feels the power of words and trusts that they can unite others. A feminist. In the most inclusive sense of the word. A lover. Even when she says she’s not. She’s strong and persistent, but sensitive and introverted. She’s stardust and flower power, the Caribbean sea, and the ever-changing moon. She’s many things, and has many yet to explore, but despite being all of these, she’s also just Flor. 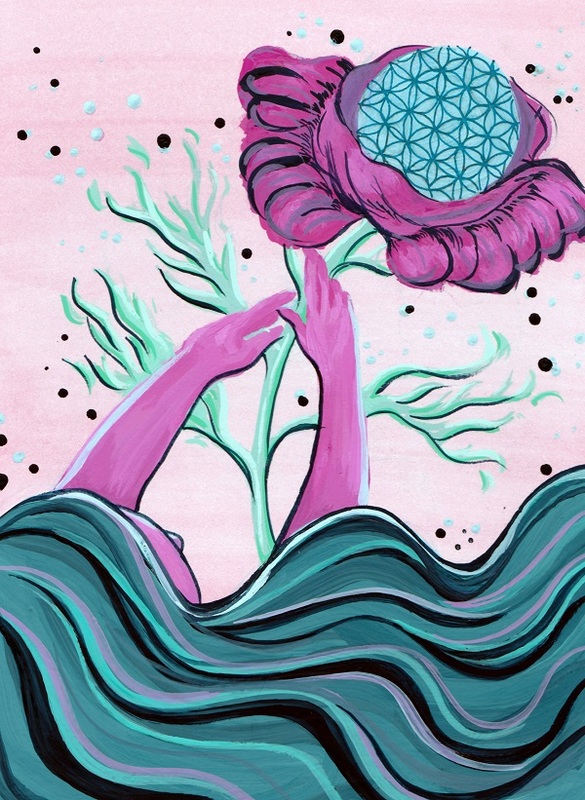 She lies in the middle of the flower of life. She’s sprouting, growing, and blooming, all at the same time. She’s not “this -but- that”, she’s “this -and- that”. She refuses to be defined by labels, but identifies with all of them. She’s the intersection of everything, as the universe resides in her, as she takes part in it. Victoria Biste enjoys reading and admiring book cover artwork. She hopes to one day work in the publishing industry. You can view more of her work through the following link: https://www.instagram.com/victoriabiste/.